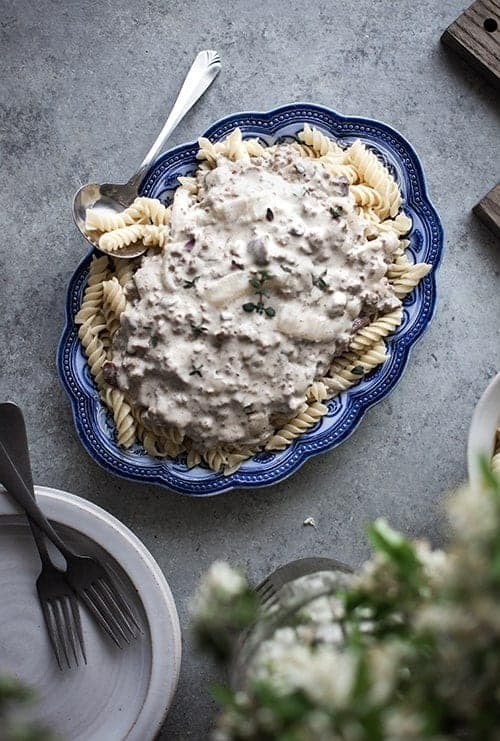 This is the best ever ground beef stroganoff recipe without cream of mushroom soup. 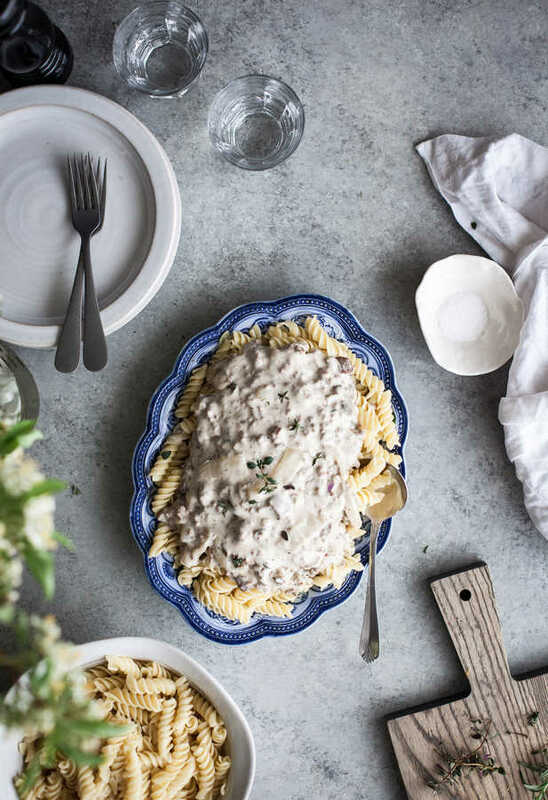 Stroganoff is so quick and easy to make and everyone likes it. This is one of those recipes that I haven’t published for a long time because it’s so simple. I tend to think that everyone already knows how to make it, but I have to remind myself that not everyone knows how to make it. And certainly, not everyone knows how to make it Clean. You will hopefully be surprised at how incredibly easy and how much better you’ll like ground beef stroganoff recipe without cream of mushroom soup in it. Both my husband and I grew up eating beef stroganoff with a can of creamed soup. I grew up with it with mushrooms, cream of mushroom soup over rice. He grew up with no mushrooms, a can of cream of chicken soup and served over noodles. My mom put a whole cup of sour cream, but his mom only puts about 1/4 a cup of sour cream. This recipe doesn’t call of any. My husband’s family always mixed in a can of peas. This recipe doesn’t have sour cream. Sometimes I include it, sometimes I don’t. If you like sour cream, add anywhere from 1/4 cup to 1 cup, depending on your tastes preference. This is also really good with stew meat cooked in the crockpot or Instant Pot until it’s fork tender. You can even make extra meat and freeze it to make it even faster down the road. My mother-in-law actually gave me the really good idea of canned meat for this. I know the art of canning is dying, but it’s awesome to buy stew meat or other cheap cuts of beef and pressure steam them. It makes the meat really tender and has a really good taste to add to this. I’ve done it several times and it tastes really good and it’s hard to let it sit on the shelf for very long. Obviously, if you don’t like mushrooms, you can easily leave them out. I like to add vegetables to my stroganoff. My favorite one is zucchini or summer squash cut in to piece and put in at the same time as the onion. It gives it another level of flavor and it’s a good way to get your children to eat a few vegetables without them even realizing it. You can pretty much use anything you want to thicken. 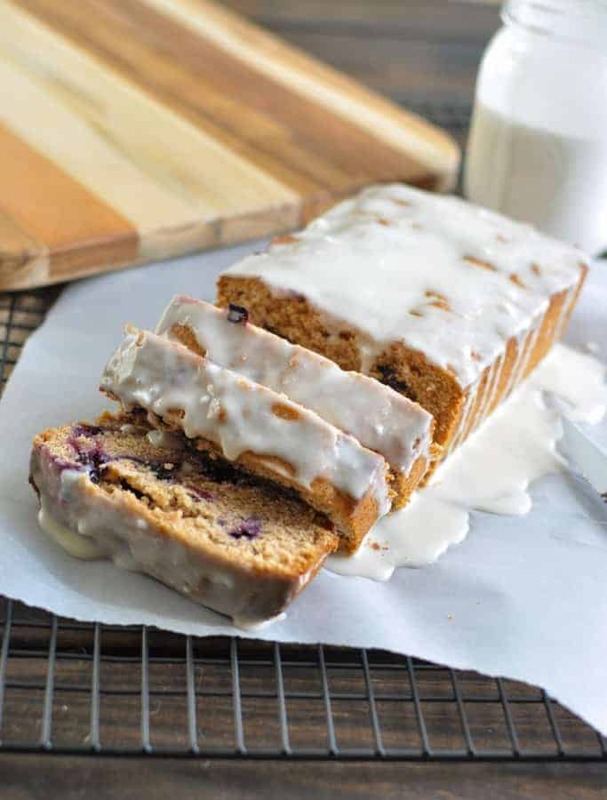 I often use spelt flour or einkorn flour, because you use so little, you can’t really taste it. I prefer the Arrowroot starch just because it doesn’t get pasty like a regular flour tends to do. This would also be good on top of brown rice rather than einkorn pasta. It’s just a matter of preference and a good way to change it up. Did you grow up eating beef stroganoff as I did? Have you tried this ground beef stroganoff recipe without cream of mushroom soup recipe? Crazy how easy it is to make your own sauce, huh? I would love to hear your comments and questions below. 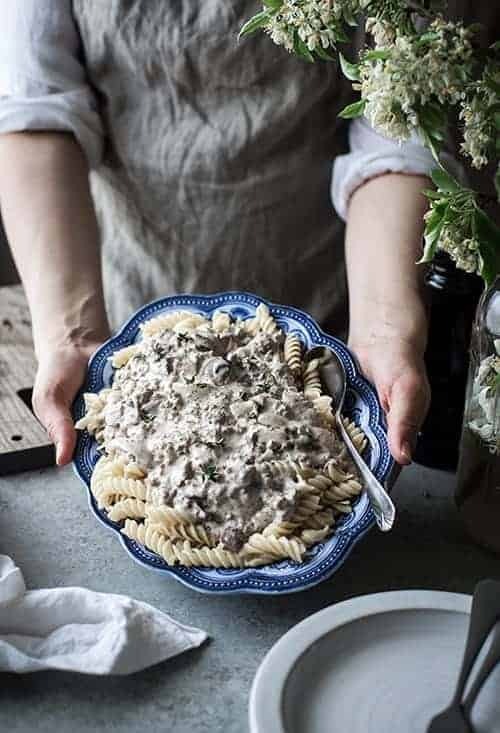 This stroganoff recipe without cream of mushroom soup is quick and easy and doesn’t use any cans. I’ve made it hundreds of times and my children love it. Such a good, easy ground beef recipe! Add the ground beef and cook, breaking into small pieces, until cooked through, 5-7 minutes. Add the oil or butter along with the onion and mushrooms. Saute the onion and mushrooms with the beef for 4-5 minutes, or until softened. Add the garlic powder, salt, pepper, and arrowroot starch to the mixture and stir until mixed in. Add the half and half and beef broth and an stir in until combined. Allow to simmer, stirring occasionally, until the sauce thickens enough to coat the back of a spoon. Check seasonings and add more salt, if needed. Serve over hot Einkorn flour noodles. This doesn’t look like much but it is easy to make and tastes real good. I Serve it with peas, they add some color I think.